We produce high performance 3D printing at 40mm per hour print speed and at 62 micron resolution. This share is A+ rating. It provides best annual and recently quarterly earnings, highest sales growth, profit margins and return on equity, also strongest relative price. Our desktop 3d printer is compact, quiet and user friendly. It can print standalone without being tethered to a PC or laptop, it has wifi connectivity so you can manage the printer remotely via a tablet phone or laptop. It also has an innovative double exposure feature, each layer can be exposed in two positions, doubling the available print volume without compromising on the print resolution (xy 62.5 microns/ z 20 microns). Our printer delivers incredible high accuracy prints, solid durability, and great print speed at an affordable price. Both the resin vat and the build platform can be quick released via a cam lock and swapped out, allowing you to quickly begin printing a second object while post processing a freshly completed print, or enabling you to switch to a different resin efficiently without having to empty out and clean the vat. Our printer package contains the model and support materials to build your 3D printed parts. With every material change, our printer provides a fresh print head to ensure optimum part quality. It’s a cinch to load the snap-in quickly — much like the ink cartridge on a home document printer. Each foil bag contains 80 cubic inches of material, which means fewer material changes and more uninterrupted, big idea printing for you. Modeling bases provide a smooth surface on which your models grow. Once printing is done, you simply take the recyclable base out of your 3D printer and snap off the model. The high performance Wifi within the printer allows for untethered printing and also for wireless connectivity for print management and notification, the browser interface allows you to easily connect from a smartphone/tablet or PC. Two large rinse tubs to be partially ﬁlled with isopropyl alcohol (IPA). Side Cutters to remove supports from your prints. We are an innovation company at its heart. We got into 3D printing, for two big reasons. First, because we saw the value it can provide today - it is a barrier breaking tool that can make some amazingly cool and useful things. After getting to know its capabilities and limits, today's 3D printers are able to help people pursue their creative dreams or reach productive goals; and at the very least, be a source of entertainment. But more importantly, we all have that unshakable feeling that 3D printers will iteratively improve until they become an everyday convenience and necessity. We know this is a future that may not be realized for 10 years, but one that requires nurturing the technology through many rounds of improvement, which seems to mirror the coming of the computer age. We took the first steps towards this future two years ago. At the time our goal was to simply make this technology more accessible to everyone, which was a lofty ambition. 3D printers were easily in excess of $1000, often had to be assembled, and required the user to learn how to write code to control it. Like many inventors we saw this and thought we could do better. So we set out to build a printer that was more user-friendly, affordable, and suitable for in-house use than any before. On the surface, we achieved that goal and quickly became a volume leader in the field, and many of our features were also quickly adopted by the industry. However, we know 3D printers are still not perfect. They will achieve true consumer-friendliness when the full user experience is improved and the hardware is made so extremely reliable that it cannot fail. After that, the software needs to guide the user through the entire experience and take out all the guess work. Models need to be verified and/or curated carefully so that every print can succeed. 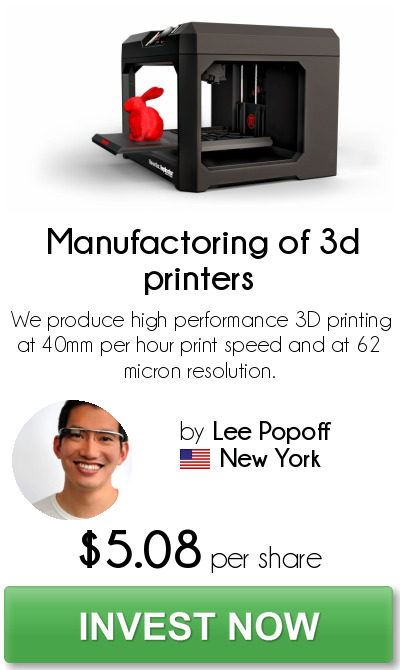 Lastly, 3D printing in general needs to be faster, with advanced product features being more affordable.